REPORTS AND OBSERVATIONS [PAST SOLAR AND LUNAR ECLIPSES Report for Solar eclipse of August 11th, 1999. Observers report for the Total Solar eclipse of August 11th, 1999. The first eclipse is supposed to be the one where everything goes wrong. In my case, my first total and two annular eclipses went according to plan but this time the eclipse gods were working against me. I left Australia on August 7th and after a gruelling 42hr transit, collapsed into my hotel bed in the Hotel Lebada in Bucharesti on the evening of the 8th August. Next morning I awoke refreshed and immediately dove into my luggage. Before leaving Australia I cut some pine into the pieces required to construct an equatorial wedge. I brought some wood glue in my hand luggage to avoid any chance of leaks. The security people in Bankok found the cannisters and asked me to explain what they were for. I glued the wedge together one piece at a time during the Monday. After it was fuly dried, I bolted a large ball and socket head to the wedges and bolted the wedge to my tripod and voila, I had a small very rough equatorial mount that enabled me to follow the sun in one motion. I'd been working on an equatorial platform but had not completed the construction due to other committments sucking up all my free time for three weeks before the eclipse. This was my quick fix. I observed the August 11th 1999 total eclipse from The Hotel Lebada located on a small island in the middle of a lake approximately 11km west of central Bucharesti, Romania. We awoke to a clear day and any thoughts of travelling to escape potential weather quickly disappeared. After a long breakfast I helped another observer Bob Filus carry his generous payload of equipment down to the tennis court where we had decided to locate our equipment. For a "small" gratuity, Bob had prearranged for one of the hotel staff to set up a large umbrella and chairs on the tennis court. Sheer luxury compared to other expeditions. Mineral water should cost less than US$1 per bottle. It escalated in price during the morning. The price seemed to be inversely proportional to the ambient light level and temperature. We had pre-purchased some water while the price was reasonable and were somewhat insulated from the temporary price increases. I heard of some hotel guests being charged around US$7 per bottle of mineral water close to totality. My plan was to measure ambient light levels, measure two temperature curves (ground and shade), take some photographs and of course have a good look. I used a dual digital thermometer. Using a remote thermistor probe I monitored ground temperature in the sun against the concrete and I monitored shade temperature using a built in thermistor with the unit sitting on a chair under the large umbrella. Light levels were measured using a Sekonic L-318B light meter with the dome removed. The dome contains a 4x ND filter. I removed it to expose the cell and gain a couple of eV sensitivity to make sure that I didn't run out of sensitivity during totality. This is probably unnecessary as my minimum reading was around 9 eV. and socket bolted to a 45 degree wedge (Bucharesti is 45 north latitude). At 9:15 UT (~T-2 hrs) I set up the thermometer, my light meter and the camera. 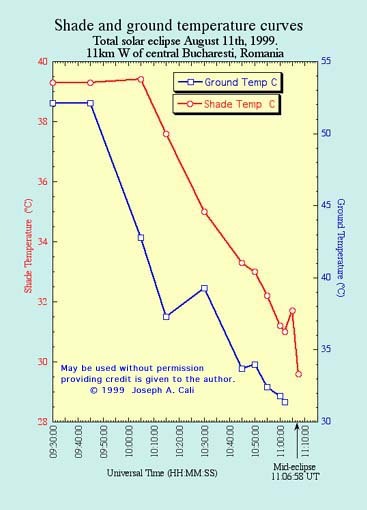 At 9:30 UT the shade and ground temperature were 39.3 C and 52.4C respectively and the light level was 19.6eV. The group on the tennis court comprised Bob Filus(USA), Manabu Hayakawa (Japan), George Lenz(USA), and another Bob whose surname I've forgotten. As a group, we timed 1st contact to get our watches synchronised for 2nd contact. About an hour or so before totality, clouds moved in from the west. They became much thicker thirty minutes before totality. We again saw the sun 15 minutes before totality and it looked as though this would be our last view of the eclipsed Sun for quite some time as there was only on very small patch of blue sky over on the horizon. Remarkably, most of my light level & temperature measurements were able to be made during breaks in the cloud. I lost two measurements only. As totality approached, the cloud cover became thicker and the breaks less frequent. Moral on the court was pretty low 15 minutes before totality. I had been watching and timing the progress of a small break in the cloud and at this point made the rash statement," don't worry, we're going to see totality." The only replies were a few pessimistic grins but fortunately, that small break in the cloud did in fact drift in front of the Sun and it spent most of totality between us and the Sun. I imagine that observers in some parts of Bucharesti must have been clouded out as the break was not very big. I didn't see or hear any reports to confirm this until I got back and read Jay Pasachoff's Williams college report. In the last few seconds before totality, I was looking at the crecent through thin cloud through the 500mm f4.5 lens when I glimpsed what I thought to be the lunar surface lit by Earthshine. This took me by surprise as I wouldn't have thought it possible. Due in part to cloud and possibly due to the haze and pollution over Bucharesti, I was unable to see the approaching shadow. I did not look for shadow bands. The corona was very compact and very detailed. To the naked eye, the coronal streamers extended about 3-4 solar radii. I didn't count the number of coronal streamers but there must have been at least 15-20 of them radiating equally in all directions. I was taken by the symmetrical distribution of the coronal display. Three prominences were visible to the naked eye and a few more were visible through the small binoculars. I counted 8 through binoculars. Light level measured as described above, dropped by 10.5+/-0.2 eV. Each eV is a factor of two. 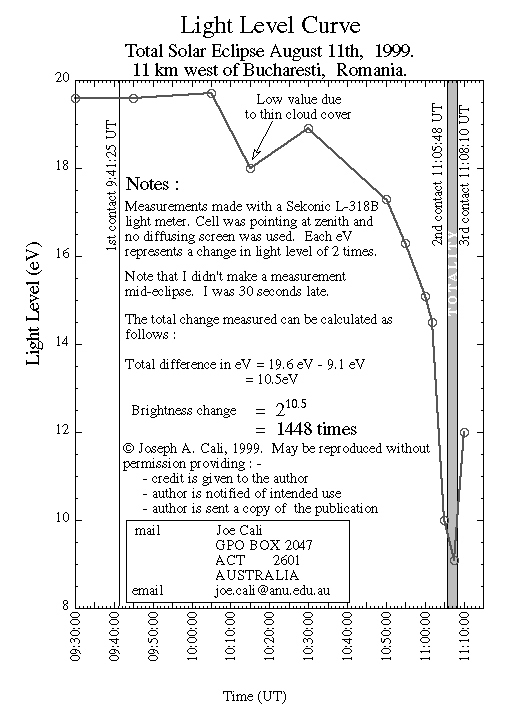 2^(10.5) = a drop in ambient light level of 1448 times. Another observer in the hotel area reported a far smaller temperature shift of around 7F however I doubt the change was this small. At the annular eclipse in Geraldton Western Australia early this year, Ernie Piini measured a temperature change of similar magnitude in similar conditions. Piini measured a shift of 40.5C ->31.1C. As if everything else wasn't working against me I had to get sick as well. Early on eclipse morning, I experienced a small convulsion, nothing serious just little click in my shoulder blades. By 10:00 UT my body temperature began to rise rapidly. It rose to about 39C by the time totality arrived. It turned out to be a 24 hr virus with incredibly bad timing. My fever made conducting experiments and taking photographs extraordinarily difficult and as you will see my data terminates immediately after 3rd contact as I decided to abandon my experiments and go to bed. Had it been perfectly clear, I may have stayed. In the back of my mind was the fact that the continuing cloud cover would likely interfere with my measurements during the last half of the eclipse. Bed seemed the better option. Even if my health and concentration had been perfect, I would have had difficulty taking all the temperature and light level measurements in the minutes around and during totality. It occurs to me that the light curve is very susceptible to the instrument setup. What do you actually measure? If you measure incident light from the whole sky, the result will be very different to a spot meter reading of a small area of sky. If any of you who read this report have any references to standard techniques for light curves please let me know. Next eclipse I will definitely want to have a better optical instrument for a closer look at the corona and a motorised tracking mount or platform to support them. I was working on a platform for this last eclipse but didn't quite get it finished due to other commitments. It only needs a few more hours work so I'll have absolutely no excuse next time. See you in Mozambique or Zimbabwe!